M.D. : In your introduction, you talk about the cognitive dissonance inspired by antique medical illustration. Looking at this stuff crosses our signals; our intellects say aesthetic rapture, our emotions say visceral horror. A good deal of it is exquisitely rendered, with obvious artistic intent; in a lot of these illustrations, the aesthetic eye and the scientific gaze share equal billing. 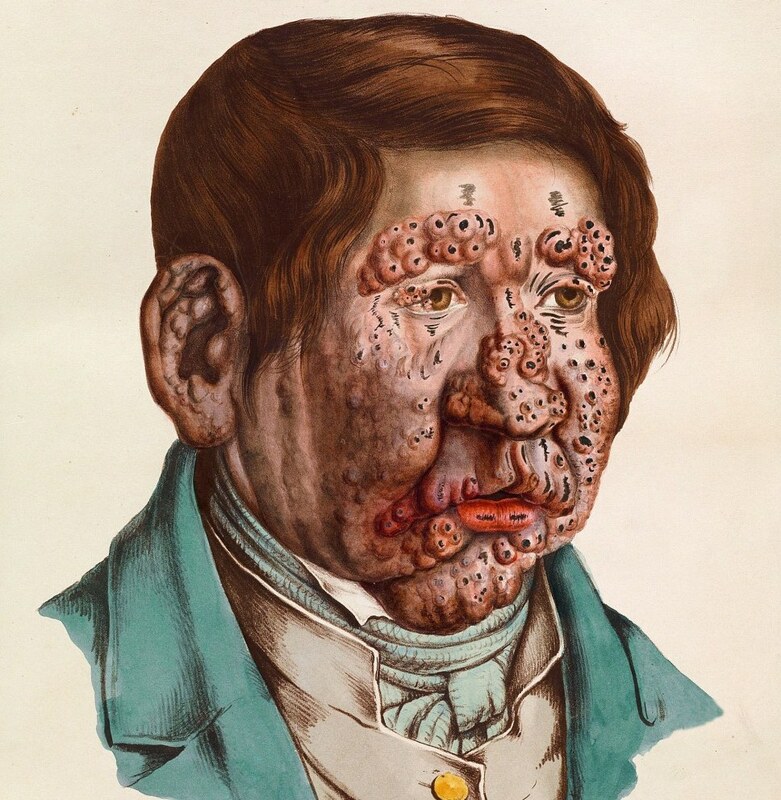 At the same time, much of the subject matter is pretty grisly stuff: dissections, disfiguring skin diseases, the ravages of cancer, ulcerations caused by typhoid, the prematurely wizened face of an infant afflicted by hereditary syphilis. To what extent do you experience these sorts of conflicted feelings, when looking at medical illustrations like the ones you’ve collected in The Sick Rose? How big a part of the motivation behind the book was the desire to make sense of the uncanny power of these images; to parse the feelings they evoke? R.B. : I think something would be wrong if these illustrations did not evoke feelings of conflict and unheimlichkeitin us. One of the most difficult, and at the same time most rewarding, ways to engage with these images is to experience and reflect on the kinds of power they possess: sympathy, disgust, beauty, photo-realism, dignity, pity. I can’t do better here than to repeat what I wrote in the introduction: “[These images] give us, so to speak, the outside of the inside; they are insistently concerned with surfaces, but surfaces that in life and health are never seen … They present an uncanny spectacle of the dead body articulated: not only prepared and mounted for display, but also made to speak (in a voice that is not wholly its own).” There’s a peculiar and intimate kind of sublimity about them; they undermine the seeming integrity of the viewer’s own body by foreshadowing its ultimate destruction through disease, injury and death.